David Bowie has many T-Shirts, Posters and Accessories. You can get them here on the official David Bowie website, BowieNet. I looked in Zara, they have four different Bowie t-shirts in the mens department at £20 each. ahah who know's why i already heared about this t-shirts? maybe a stupid question, but you don't have Zara in Canada? is it only in europe? Thanks, LadyStardust. I'll have to go there and take a look. It looks good, and quite rare to find a long sleeve one nowerdays. Also... There is a David Bowie top in the Punky Fish store and online. 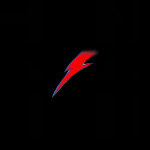 It is very nice, it has the outline of Aladdin Sane, and the bolt has the Union Jack flag in it. Subject: Re: David Bowie merchandise.